I’ve been spending a fair amount of time in a Viking village with Uilleam in my work in progress Son of Courage, so I thought I’d share with you a few things I’ve learned about Viking religion. 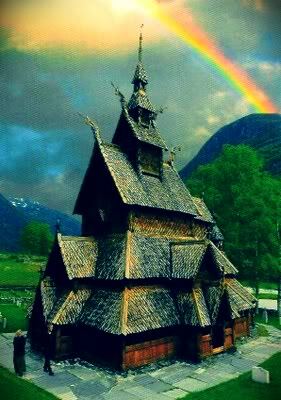 The Vikings celebrated their many gods in natural places such as sacred groves, stones, and pools, but they also had a unique style of worship architecture called the hof. It was a wooden structure, square or rectangular, with an emphasis on height that wasn’t seen in other architecture of the time. Often these hofs would be accompanied by some of the natural features like an oak grove or a pool. In my fictional village of Vasthammar, I decided to incorporate both. Historical accounts mention that these hofs, groves, and pools were often the sites of ritual sacrifices that would include all manner of animals and frequently human sacrifice as well. The Vikings worshiped a large pantheon, but chief among their gods were Thor – the god of thunder, Odin – the god of war, and Freyr – the god of celebration. Descriptions from the time mention statues of the gods present in the hof, and sacrifices would be brought to the god most likely to help based on their area of expertise. After three centuries of missionary activity in Scandinavia and other territories, eventually the Vikings universally accepted Christianity and left their pagan ways behind them. But vestiges still remained, as evidenced by the unique frame churches of Scandinavia that very closely resembled the old pagan hofs. Since Uilleam will be spending a significant amount of time in and around the hof in Vasthammar, I thought I’d share this interesting fact with you. That’s pretty interesting. I’ve always to know more about the vikings. That hof looks amazing and beautiful! Great idea researching the history and incorporating it into your book. As a reader, I appreciate when authors bring their characters environment and experiences to life with cool facts.